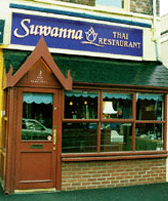 Suwanna Thai restaurant in Belfast. The Traditional Thai Restaurant offering authentic thai cuisine in a relaxed and friendly surrounding. Have you got Google Earth on your computer? If so, then download the Google Earth Map of Suwanna. Is this the wrong position for Suwanna? If you think so, then modify its position.